Gray mould and botrytis bunch rot. Usually noticed by a fuffy, light grey fungal mass over the infected parts (often flowers and buds), although affected parts may go brown and soft before the fungus becomes visible. It can affect growing plants or stored fruit/roots. This is the fungus you will see on your strawberries if you keep them past their use by date! Black sclerotia (a resting state where the fungal mycelium strands are tightly packed together), which are about 2mm across, can be produced in badly infected plants and then overwinter on the ground, ready to infect young seedlings in the spring. The fluffy mould is unsightly and, in wet weather, will eventually rot the plant material on which it lives. In lettuce, the plant will turn reddish brown at the base and then rot off, turning yellow and dying. In tomatoes, it damages side shoots and yellow spots (called ‘ghost spots’) develop on the fruit. In many flower crops (eg chrysanthemums) the infected petals have purple spots and can lead to ‘mummified’ flowerheads in very damp conditions. On many flowers and vegetables, including lettuce, tomatoes and strawberries. Particularly on damaged plants (eg through herbivore attack or frost damage). It occurs in damp conditions and millions of spores can be carried by the wind to infect new plants. 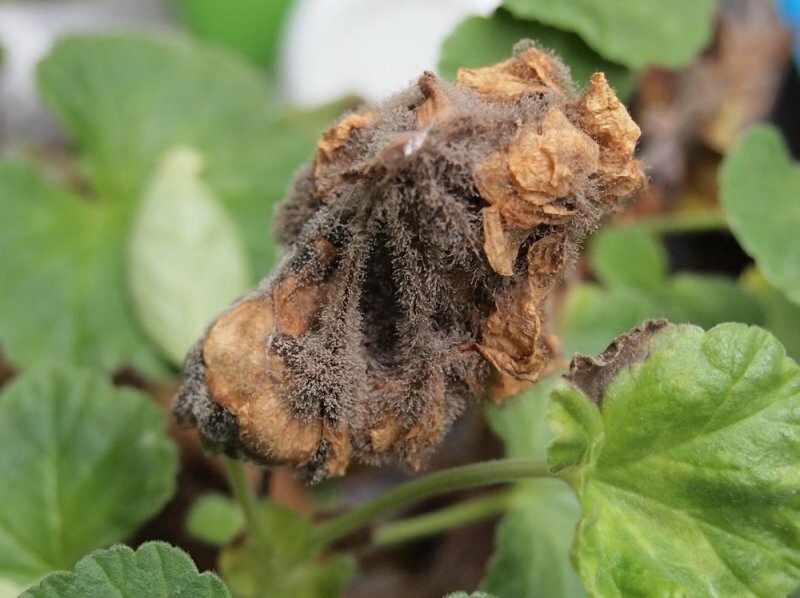 Botrytis cinerea infects wounded parts of plants, so it’s important that in damp conditions any damaged leaves or buds are removed. This includes any decaying fruit. Poor drainage, overwatering, overcrowding (ie lack of air flow between plants) and too much nitrogen (from fertilisers) should be avoided. Glasshouse environments should be controlled so that the humidity (particularly overnight) reduces the formation of dew, which can carry the infection between plants. Soil sterilisation can prevent its spread. Cut out any infected parts if possible, where badly infected remove the entire plant. Infected parts should be destroyed (eg in municipal green waste or by burning) and not put onto domestic compost. Professional horticulturalists can make use of protectant fungicides such as iprodione and chlorothalinal, both of which can be sprayed onto crops, iprodione also being available as a paste to apply to damaged plant surfaces. Peony grey mould blight, Botrytis paeoniae, is a close relative of Botrytis cinerea which only affects peonies (Paeonia species).